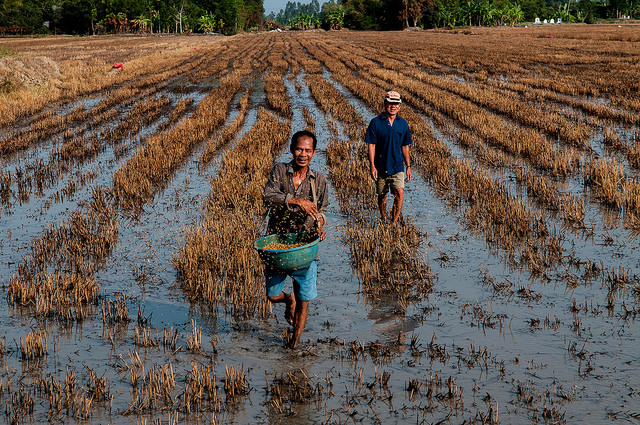 CARIAA focuses on three climate change hot spots, including delta regions such as the Mekong. Last week saw the meeting of the Intergovernmental Panel on Climate Change in Peru. The event followed the release last month of the Synthesis Report, which provides the most comprehensive assessment of climate change ever undertaken- bringing together the findings and analysis of over 800 scientists within the field. The report emphasises, with greater certainty than in any previous assessments, that emissions of greenhouse gases and other anthropogenic drivers have been the dominant cause of observed warming since the mid-20th century. It also highlights the particular vulnerabilities of different communities worldwide; communities that have often contributed little to the problem itself and who are already suffering its consequences. The Collaborative Adaptation Research Initiative in Africa and Asia (CARIAA) is a programme implemented by the International Development research Centre (IDRC) and funded by the Department for International Development (DFID). It aims to build the resilience of those vulnerable populations identified in the IPCC report. Working in Africa and Asia, the programme focuses on three climate change hot spots: semi-arid regions, deltas and glacier and snow fed river basins. These hot spots straddle countries and continents; the project aims to identify trends in climate, and hence solutions and adaptation strategies, based around ecosystems rather than geographic locations. The initiative is a multi-regional and interdisciplinary programme that supports high-calibre research and policy engagement through a network of four research consortia, generating and sharing new knowledge. The dissemination of this knowledge is key to the development of resilience in the areas identified. The reach and engagement potential across this broad network is vast, but it brings with it unique and complex communication challenges. CommsConsult, with its experience of working at the interface of research and policy, is working with CARIAA to help them develop a robust and effective Communication Strategy. In partnership with Practical Action, we are conducting a needs assessment of existing communication channels within and between the consortia. The work is part of the initial phase of a larger project. The review conducted by CommsConsult will provide CARIAA with recommendations that can be taken forward and implemented to develop a more robust and responsive communications strategy across the project. CommsConsult is excited to be working in support of this project, perhaps particularly at a time when the world is watching activities in this area. People are listening more attentively to discussions in and around climate change- new potential audiences can be accessed more easily. However, that doesn’t necessarily mean that everything that should be heard can be heard. Research has to feed into discussions that operate at different levels-providing evidence where it is needed and ensuring it is understood, as well as nurturing engagement and awareness. All we need is the will to change, which we trust will be motivated by knowledge and an understanding of the science of Climate Change. Pachauri identifies that social and political motivation can only come from greater understanding of research and evidence. His statement, made in the synthesis report earlier this year, underlines the value of the work being done by programmes such as CARIAA and highlights the significant role that knowledge sharing can and should play in all initiatives of this type. The research, undertaken by the consortia within CARIAA, brings together the disparate and vulnerable communities identified in the IPCC report- communities that are being discussed in high-level debates this week. The knowledge base, which CARIAA is developing, will provide better evidence on how these communities can adapt within the dual context of ecosystem and region. However, while the spotlight may have rested on these communities in the past weeks, CARIAA has to ensure that their challenges and solutions remain as a key part of any future narrative around climate change adaptation. By being part of the programme at this early stage, CommsConsult hopes to enable this and to enhance understanding among the various stakeholders with the hope that this will indeed be a motivator for positive change.